I was going to write about fish sauce and all of its awesomeness but I’m going to save that for another post when I have more time. But! 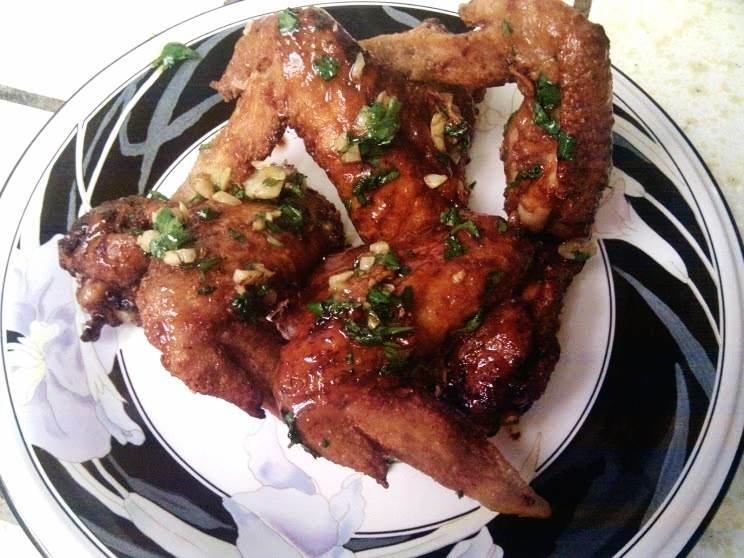 It lead me to thinking about this awesome chicken wing recipe that involves fish sauce; so I’m going to share it with you. OK, at first when you hear fish sauce wings, it sounds pretty gross but trust me these wings are amazing. I tried them at Pok Pok in Portland a few years ago and immediately thereafter I sought out the recipe. Now I try to cook them up whenever I can. They are also very good for any occasion/season. In a small saucepan, simmer the marinade over moderately high heat until syrupy, 5 minutes. Strain over the wings and toss. Top with the cilantro, mint and fried garlic and serve. Please be careful when working with hot oil! I like my wings on the more crispy side so I left them in a couple minutes longer. I served mine with a side of jasmine rice and some pickled carrots and daikons. I hope you enjoy them as I did!